FxCraft Trade Manager (FTM) is a convenient tool for manual trading on the most popular Forex platform – MetaTrader 4. It allows for quick and intuitive opening, closing and managing orders. It facilitates and accelerates execution of many standard actions, which often take our precious time and increase chances of making mistakes. It is perfectly suited for dynamic scalping and traditional day-trading. It also works perfectly as a simulator or a tool for training if you run it on the built-in MT4 Historical Tester . FTM enables among other things to send market or pending orders with Stop Loss and Take Profit of a certain size (order lots defined by the user or calculated on the basis of specified risk) by one click or keyboard shortcut. We can also specify the date and the time when the order (or orders) will be opened. It is possible to (partially) close orders as well as selected types of orders. By FTM we can manage open orders in many ways by defining e.g. 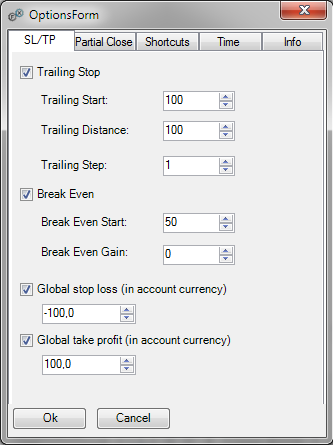 Trailing Stop, Break Even, Global Take Profit, Global Stop Loss. It is also possible to define levels of partial closing of open orders. We have the ability to quickly modify the levels of Stop Loss, Take Profit and Open Price of a pending order. There is also an option to reverse the position by one click. We encourage you to read the full User Manual and to download a trial version that can be used without restriction for 10 days for free. We can use the basic window to place orders in two modes: “Default” and “Both sides“. In the “Both sides” mode we have separate settings for short and long positions. In addition, we can simultaneously open both positions (long and short) by clicking the “Open Both” button. This option is especially useful when we open pending orders just before the news. There is also a very comfortable Order Table. It allows us for fast and comfortable management of each order separately. Partially or fully close position. The ability to define any number of our own partial close levels (which can be used as a hidden Stop Losses or hidden Take Profits). The ability to specify whether you want to be informed about the activities/messages. We encourage you to read the full User Manual. First, turn off the MT4 platform on which you want to install the tool. Then run the downloaded executable file. If necessary, we agree to make changes to our computer. In the installer choose on which MT4 platform you want to install the tool and click on “Install”. Once you have successfully installed the tool, you must restart the MetaTrader 4 platform. 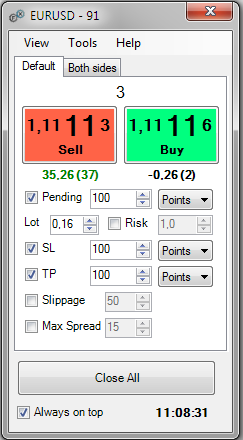 In the Navigator window on the MetaTrader 4 Platform you will see FxCraftTradeManager ready to use. To start the tool on the selected currency pair drag and drop it onto the desired chart. During the launch the tool, a window with parameters will appear. Make sure that the options ”Allow DLL imports” and ”Allow live trading’’ are selected. I would like to add my own functionality to FxCraft Trade Manager. Is this possible? Of course. We can customize FxCraft MT4 Manual Trader for your individual needs. Please write to us at orders@fxcraft.biz, and we will together work out a solution. Added the ability to pin FxCraft Trade Manager window to the chart. Added the button which enables to quickly and easily take a screenshot and save it in the selected location. In strategy tester it is now possible to move SL, TP and OpenPrice line on the chart by mouse. Introduced other amendments to improve the operation of the tool. The ,,preview” mode of order sending was added. New mode ,,Cash” for counting order’s lot, stop loss and take profit was added. Added the ability to send order with comment. 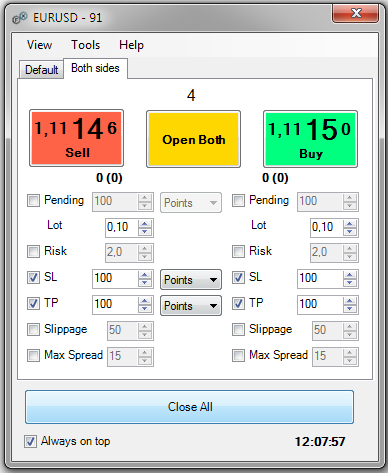 New mode for counting risk on CFD and Futures contracts was added.